January 2012 was the globe’s 19th warmest on record, according to NOAA, which is pretty much what one would expect given the prolonged La Niña conditions dominating the tropical Pacific and the fact that we’re still climbing out of the last solar minimum. The characterization could be made that despite the cooling being exerted, the globe still ended up being warmer than more than 110 other January’s! It is useful to keep in mind when reading about these type of circumstances that there are multiple signals occurring at the same time (solar, ENSO, AGW, etc.) 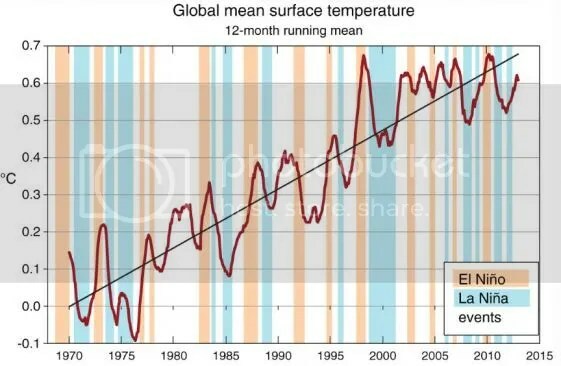 and the state of global temperature (or any other variable) at any one point in time is but a snapshot within larger trends. Categories: environment, global warming, science | Tags: global temperature, La Nina, NOAA | Permalink. I’ve written about Arctic sea ice conditions for a couple of years now. As I’ve written new posts, I’ve tried to include information regarding the science behind the conditions being written. 2010 was a particularly bad year for Arctic ice, as conditions were recorded to be well below average conditions for months at a time. Arctic ice in September 2010 challenged the record low minimum extent observed in the modern era in 2007. My summary conclusion after paying attention to Arctic sea ice is this: the Arctic has entered into a new climatic regime. Conditions are now regularly quite different than those observed in the past couple hundred years. I’m going to provide a broader look at this topic in this post. Of greater complexity is the “better researched” part of my statement. 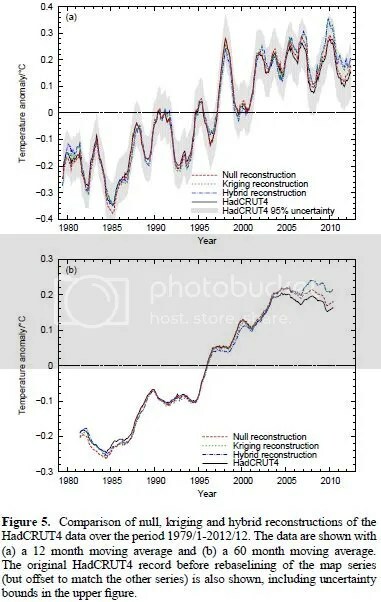 Critical feedbacks were largely kept out of climate model runs leading up to the 4AR. There is nothing intrinsically wrong or manipulative about this. Those feedbacks remain less researched and therefore less understood than other processes included in state-of-the-art model efforts. That situation is improving, as feedbacks are coming under increasing scrutiny. This is where politics intrudes: somebody has to fund that research. There was a strong effort during most of the past 10 years to slow down or stop this kind of climate research. Budgetary pressures moving forward will cause potential future research to be shelved when it’s needed most. Back to the IPCC 4AR. One of the problems with relying on scenarios that don’t accurately reflect the true state of the climate system is projections are starting to look overly cheerful. Take Arctic sea ice extent as an example. From the 2009 Copenhagen Diagnosis, we can see that not only does the mean of the IPCC models over-project the extent of September Arctic sea ice only a few short years after making the projections, but the worst-case scenario wasn’t able to capture how low sea ice extent would get prior to 2010 (data through 2008); [h/t msobel for reminding me this graph existed]. September 2009’s extent was similar to 2008’s. 2010’s looked more like 2007’s, which is represented by the lowest point of the red line in the above graph. In other words, the observations time series continues to record values substantially lower than the bottom of the IPCC models’ range. Scientists (and others) love to ask, “Why?” So, the question should be, “Why were the IPCC models so far off on this projection?” A quick note: a growing number of other kinds of projections are showing similar signs of being worse than projected much sooner than was thought to be the case. I will discuss some, but not all, of the factors involved in this phenomenon. Up and up it goes. 2010’s average CO2 concentration was 389.69ppm. That will be the last time in a long time that the concentration will be below 390ppm. Today’s concentration is higher than at any point during the past few hundreds of thousands of years. Oh yeah, I almost forgot, the last time concentrations were above 400ppm for an extended period of time (somewhere between 400 and 560ppm), the Greenland ice sheets collapsed. That’s because there is a melting ice/warmer air feedback that occurs around Greenland. The problem? Nobody knows exactly where the tipping point leading to collapsing ice sheet exists. Since we’re only 10ppm and 5 years away form 400ppm, does anybody seriously want to continue gambling? After all, it’s going to take quite some time to get that concentration back below 400ppm; more time will be required the longer we wait. If it’s too hard to make out all the little details, check out this web page, where you can click on a PDF which shows a much larger version. I’m going to concentrate on the top two boxes in this graph, which show temperature anomalies for five zones (upper-left) and for the two polar zones (upper-right). The first thing I want to point out is the period between 1940 and 1980. This period has been cited recently by climate zombies as one reason not to listen to climate scientists. According to the zombies, predictions were made in the 1970s about global cooling. Nothing exists in the scientific literature supporting this claim, of course. What scientists did say in the 1970s was the recent warming trend was no longer evidenced and they wondered what could be causing it. Without getting further into the minutiae, the top two time series show where the global signal originated from: the Arctic. It was the zone that showed the strongest signal that looks similar to the signal seen in the global temperature anomaly time series. Since the 1970s, the Arctic’s surface temperatures have warmed more than any other zone. You can see that in 2010, the Arctic temperature anomaly was greater than 3.6F (2C). The northern mid-latitudes (23.6°N to 64.2°N, or the zone in which most of us live) has “only” warmed by just under 1.8F. The northern mid-latitudes showed a slight cooling from the mid-1960s to the mid-1970s, but if you look at the time series on the bottom-left, the scale is much smaller than the Arctic graph in the upper-right. The red arrows represent flow direction of Atlantic water entering the Arctic Ocean at depth. The white arrows represent flow direction of ice exiting the Arctic Ocean at the surface. The solid white line represents the average sea ice coverage for April from 1989 to 1995. The broken white line represents the average sea ice coverage for April from 1963 to 1969. Why are the time series and study results relevant to the comparison of ice extent observations against IPCC model projections? Because they represent only a small number of examples of how increasing understanding of the Arctic has occurred in recent years and that’s problematic when interpreting the IPCC’s results. I haven’t covered how the warming observed in the Arctic so far is thawing permafrost both on land and underwater, which is projected to release 1 Billion tons of carbon into the atmosphere yearly by the 2030s – and how such a process likely won’t be included in the IPCC 5AR. Additionally, most of that carbon will be released as methane, which is 72 times as efficient a greenhouse gas over a 25 year period than CO2. I haven’t covered how the retreat of Arctic sea ice is causing additional solar energy to be collected by dark sea water instead of being reflected back into space by white ice – and how such a process also isn’t included in today’s climate models. I haven’t covered how over 80% of the solar energy absorbed in the past couple hundred years is currently stored in the world’s oceans, mostly at depth. When that warmer water rises to the surface, it will interact with a warmer atmosphere in ways that are not completely understood. Of course, warmer waters means Arctic sea ice will have even less of a chance of existing year-round in tomorrow’s world. To some extent, I have talked about the dangers involved with spending most of our research time on moderate emission/warming scenarios, when our actual emission scenario is closer to the worst-case considered in the 2007 report. But all of the feedbacks I’ve discussed so far are lacking from all of the emission scenarios. What will happen when those feedbacks are included? Instead of “5.0 °F with a likely range of 3.1 to 7.9 °F” for the A1B scenario or “7.2 °F with a likely range of 4.3 to 11.5 °F” for the A1FI scenario from the 4AR by 2100, the globe could experience 10-13°F warming by 2100. Long before then, the Arctic will likely have attained a new stable climate; one that is quite different from the climate present during most of our species’ existence. The Arctic has entered into a new regime. Even climate scientists are playing catch-up right now, which means the American public is way behind in understanding what changes in the Arctic mean to them. 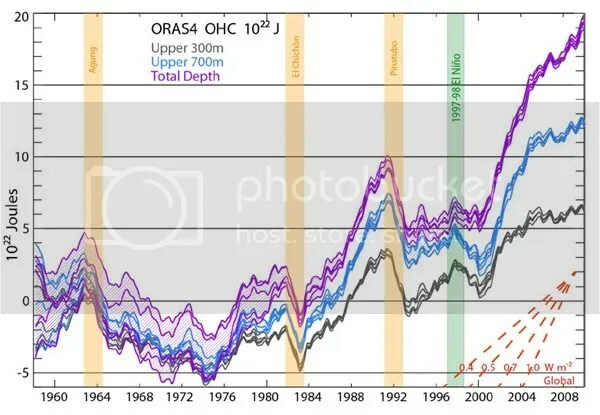 Categories: global warming, science | Tags: 2007 IPCC 4th Assessment Report, A1B emissions scenario, A1FI emissions scenario, Arctic, arctic sea ice, climate feedbacks, CO2 concentrations, CO2 emissions, Copenhagen Diagnosis, global temperature, global warming, ice sheet collapse, IPCC 4AR, IPCC 5AR, James Hansen, warming Arctic | Permalink. In the past week or so, NASA released data and NOAA released a report confirming climate activists’ fears: 2009 is going to challenge global temperature records. There are a number of reasons this is especially troubling to me, which I’ll get to below. First, the news is this. Two independent scientific agencies confirm that September 2009 had the 2nd highest surface temperatures on record. Dating back to 1880, the only warmer September occurred in 2005. 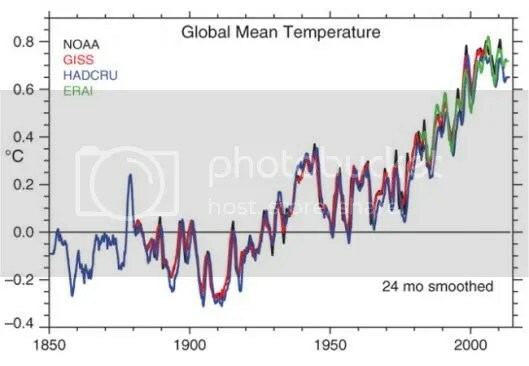 From NOAA: the combined global land and ocean surface temperature was 1.12 degrees F above the 20th century average of 59.0 degrees F. NASA’s measurement, probably the best in the world, indicated a 1.17F anomaly, very much in line with NOAA’s calculation. Categories: global warming | Tags: 2009 El Niño, climate change, global temperature, global temperatures, NASA, NOAA, solar minimum | Permalink. The globally-averaged land and sea surface temperature for April 2009 was the fifth-warmest in the past 130 years, according to a NOAA report. This occurred as the El-Nino/Southern Oscillation phenomenon moved from a cold phase (La Nina) to a neutral phase. The second graph on the page I’ve linked to shows where the warmest anomalies were found: eastern Russia, Europe and southern South America. Those of us in the middle third of the U.S. (Rocky Mountains to the Mississippi River valley) experienced cooler and wetter conditions than are normally found. In the Front Range of Colorado, a winter-long drought was eased by a pretty wet April. The anomalies during April were +1.00°C (+1.80°F) for land only, +0.44°C (+0.79°F) for the ocean only and +0.59°C (+1.06°F) for land and ocean combined. These anomalously high temperatures occurred during the end of a La Nina, which tends to depress temperatures, as well as during the most extensive solar minimum in over 100 years. Many climate change deniers cite solar cycles as the most important contributor to climate variability. 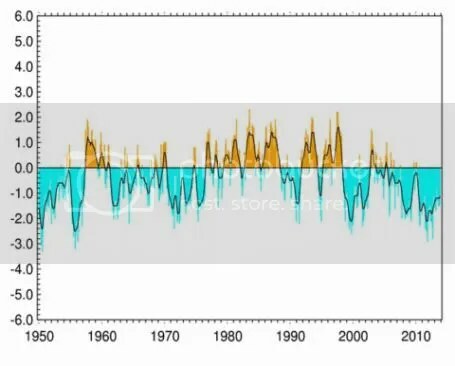 If the 5th warmest temperatures in recent history were recorded during the most intense solar minimum in recent history, what do folks think will happen when the solar cycle transfers towards its maximum? What will happen when the next El Nino occurs? 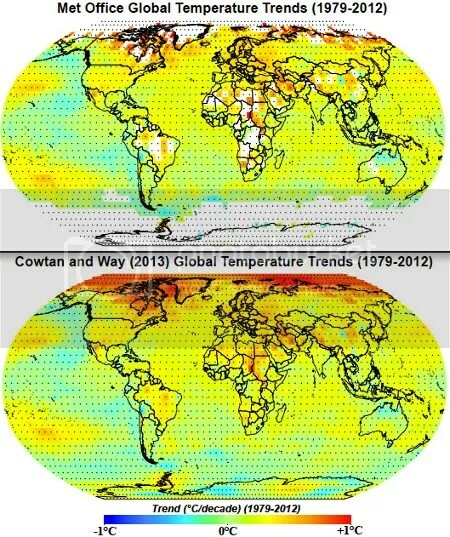 Will temperatures somehow decrase globally? I don’t think so. Categories: environment, global warming, science | Tags: global temperature | Permalink.